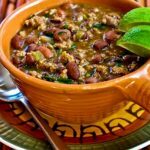 This Ground Turkey and Bean Stew with Cumin, inexperienced Chiles, and Cilantro has pinto beans and it’s thickened with refried beans, and this tasty stew is low-glycemic, gluten-free, dairy-free, and South Beach Diet friendly! Use the Recipes-by-Diet-Type Index to seek out a lot of recipes like this one. I used ground turkey rather than chicken thighs, and Rancho Gordo Yellow Indian lady Beans rather than pink beans, however I unbroken the generous quantity of garlic, cumin, and diced inexperienced chilies from the first formula. I conjointly superimposed a will of frijoles refits to thicken the stew, and though it all over up being not excessively attractive, this clothed to be the type of comforting ground turkey bean stew I’d like to have within the electric refrigerator for a fast dinner. Don’t skip the lime wedges for serving this; they’re the right of entirety. 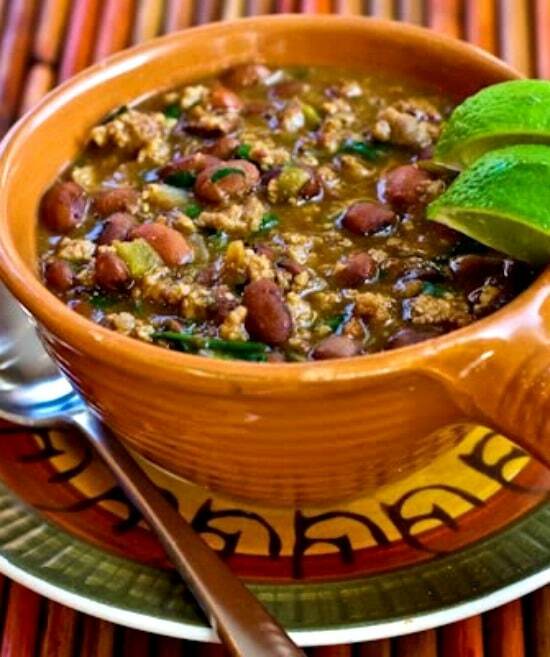 Click here for ground turkey and  bean stew with cumin,green chiles,and cilantro recipe! Heat the 2 T olive oil in a heavy frying pan with high sides, add ground turkey, season to taste with salt and fresh ground black pepper and cook over medium heat until the turkey is well browned. This will take 12-15 minutes; don’t rush the browning step. While turkey browns, peel a large onion and chop into 1/2 inch pieces. When turkey is well browned, push it over to the side of the pan, add 1 tsp. more olive oil, add onion pieces and cook about 5 minutes, until onion is lightly browned. Stir in minced garlic and ground cumin and cook the mixture about 3 minutes more, stirring a few times. Add 3 cups cooked beans, 2 cans diced green Anaheim chiles, and 3 cups chicken stock. Stir to combine, then reduce heat and let the mixture simmer about 30 minutes. Combine 1 can refried pinto beans with 1/4 cup water to thin the beans, then stir refried beans into the turkey and bean mixture. Simmer about 25 minutes more. While mixture simmers, chop 1/4 cup (or more) cilantro. When the stew is as thick as you’d like it to be (about 25 minutes for me), stir in chopped cilantro and simmer 5 minutes more. Serve hot, with lime wedges to squeeze lime into the stew when you eat it.